Myopia is a vision disorder where the person sees blur in the distance. In a myopic person, the eye is therefore elongate the focusing of the image is therefore in front of the retina. The result is a blurred image. 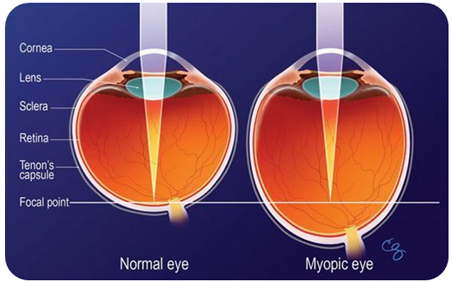 * Myopia axils: the eye is too long, the ray focusing from infinity is before the retina. * Index myopia (power): in this case the lens is too curved, so too convergent and rays focus before retina. The image of a point is not a point but a spot on the retina, the perception of a distant object is blurred. More distant the object is, the more it is blurred. In sum, the myopic sees less far than near. This can be corrected by glasses, contact lenses or refractive surgery.